This work was funded by English Heritage and was managed by David Knight under the guidance of Paddy O'Hara and Duncan Brown of English Heritage. Work on the site archive was conducted on behalf of Trent & Peak Archaeology by Scott Lomax between August 2012 and April 2014, assisted by Annemarie Wheat between January and July 2013. Work on the pottery material and supporting documentary archives was undertaken by Vicky Nailor. Thanks are extended to Ann Inscker and Rebecca Arnott (Nottingham City Museums and Galleries) for providing access to archive material and for advice on the curation and storage of material. 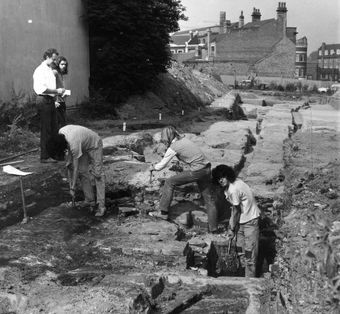 Gordon Young (Nottingham City Archaeologist) provided invaluable background information regarding all six excavations and assisted in the location of archive material. Mags Felter (YAT) prepared the metalwork condition assessment and prepared digital copies of the radiographs. Geoff Krause (YAT) repackaged metal small finds from the excavations.